Paros is a very pretty and typically Cycladic Island. Busy and cosmopolitan, Paros is less expensive than nearby Mykonos, but full of delights to explore. Sugar cube houses, domed churches, windmills and Venetian mansions mingle with discos and bars. Shutterbugs will love the winding and shady alleys that open up to squares where bright flowers overflow from the white balconies above. Paros is the third largest in the Cyclades and is lush and green and scented with thyme, fruit trees and olive groves. The highest mountain is Mt. Profitis Ilias at 770m. Paros has great beaches, some with the best water sports in the Greek Islands – including wind-surfing for which Paros is the capital of the Greek Islands. In July and August the winds are strong and the wind-surfing is ideal. Paros was known for its brilliant white marble, the best in the world, which brought prosperity to the island in the early Cycladic age that endured through to Roman times. Paros is ideally located and well-serviced by ferries, making it a great base for exploring other islands in the Cyclades such as Mykonos, Naxos, Ios and Santorini. Paros is the hub of the Cyclades for ferries and offers a wide variety of connections. The island, as a result, can get very busy during the peak summer months of July and August, so it's a good idea to have your accommodation booked if you are planning to stay. The main towns are rather touristy, but if you wander outside of these towns you'll find charming villages, vineyards and olive groves. Paros is easy to explore with a good bus service linking the three main towns; the port town of Paroikia, the trendy 'fishing village' resort of Naousa to the north, and Lefkes in the central mountain region. Cars and motorbikes for rent are plentiful and the road systems are relatively good. It's easy to visit the off the beaten track villages, and small boats offer excursions to remote beaches. In Paros, make sure you try the white and rose wines, and the kitron liquer (local lemons). Also known for shellfish and sardines. Paros is home to the impressive Church of Lady Ekatontapyliani (or Katapoliani). The feast day for this church is August 15, as is the case for Tinos, and an important greek holiday throughout the greek islands and mainland. Online Travel guide with the best accommodation in Paros. Find the cheapest hotels is Paros & get exclusive online deals. Great rooms at bargain prices. Book online now! Compare Hotel Prices and read Reviews from others. Great Hotel rates and information See photos, reviews & what's nearby Paros . 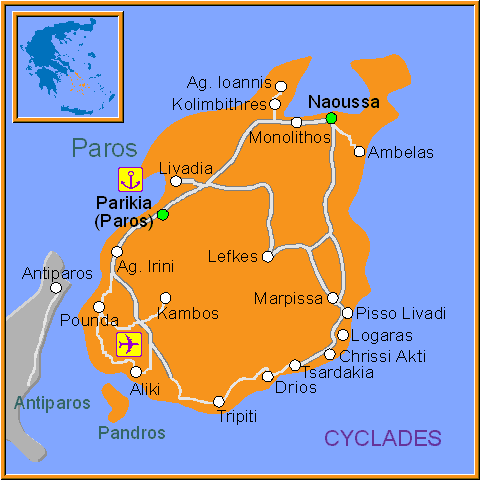 Detailed tourist and travel information about hotels of Paros providing also regional information.